Welcome to the start of a great week! Here at #ThatBusinessShow, we plan ahead to invite people on the #MorningAir every weekday at 8am on #1250whnz to give you the inside scoop on our community, and who’s making an impact in it! If you’re a local professional or you have an interesting story to tell, and want to get your word out there, let us know at christian@tampabayradio.com and we will book you on the show! Today on #ThatBusinessShow, we had Michael K. Farr, President and CEO of Farr, Miller & Washington Investment Counsel; Todd Jones, Principal of RealAdvice, and John Duffy with Steve Howerton, Co-Owners of CityWide Maintenance! We were also joined by our lovely Co-Host, Stella Guidicelli! If you missed on the little discussion between Jamie and Stella, head to http://www.tampabayradio.com to listen to the show on demand, or head to my YouTube Channel to watch the video! Thank you again for joining us on another #MorningWithMeloni! 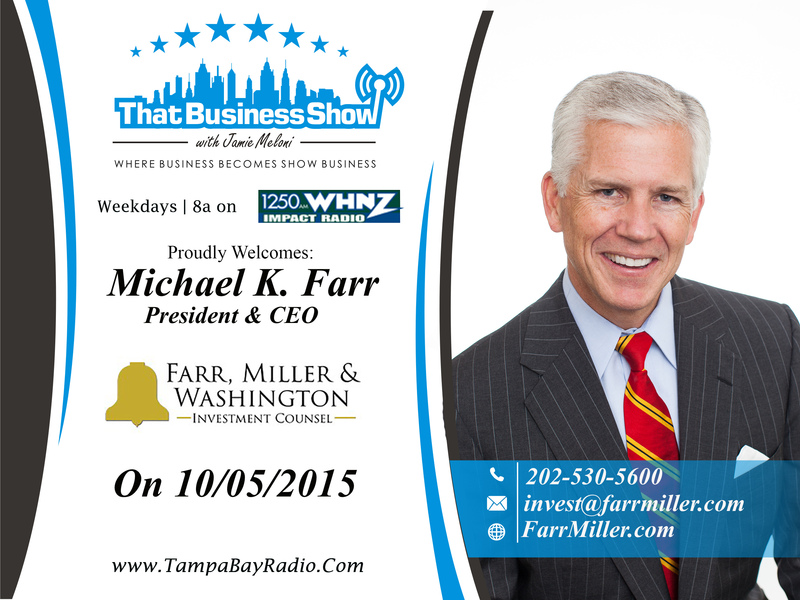 First up on #ThatBusinessShow was Michael Farr, President and CEO of Farr, Miller & Washington Investment Counsel. He is also Chairman of the Investment Committee and is responsible for overseeing the day to day activities of the firm. With a very impressive resume, Michael has appeared on The Today Show, Good Morning America, NBC’s Nightly News, CNN, BloombergTV, Reuters, and the Nightly Business Report. Additionally, he is the author of “A Million Is Not Enough“, “The Arrogance Cycle“, and “Restoring Our American Dream: The Best Investment“. You can check all of those out online or at his website at www.FarrMiller.com. Jamie and Michael discussed the current state of the economy, and Michael shared with us his recent editorial on why he thinks the economy is doing fine and that it will maintain stability despite recent scares from other struggling global economies such as China. He also shared with us his opinions on investments and Wall St. So if you missed this great segment, head over to http://www.tampabayradio.com soon to check out Michael Farr, President and CEO of Farr, Miller & Washington Investment Counsel! 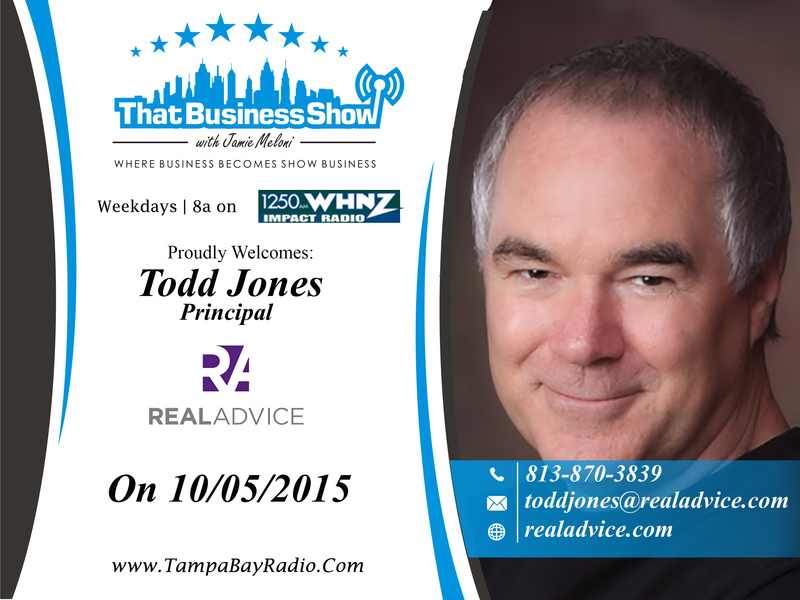 Next on #ThatBusinessShow was Todd Jones, Principal of RealAdvice. Todd has provided expert testimony, litigation support, ad valorem property tax counseling and representation, appraisal review, investment advice, and much more since 1985! Todd and Jamie spoke about what he perceives as the next Bombshell technology, 3D Printing! Todd believes that 3D printing will become involved in nearly all aspects of our lives, just as the internet has done! As confusing as a technology like 3D Printing is, Todd explained to us that it could even potentially to craft everything from dresses and food, to even materials for housing! If you want to find out more about Todd Jones, Principal of RealAdvice, head to http://www.tampabayradio.com now! 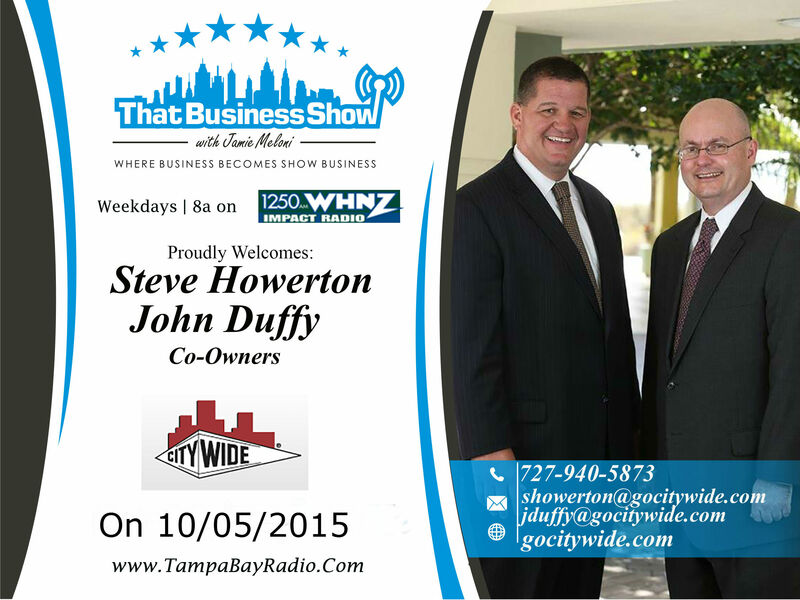 On our last segment, Jamie Welcomed John Duffy and Steve Howerton, Co-Owners of CityWide Maintenance. Named Rookie of the Year and fastest franchise to 100K in monthly volume while maintaining 96% customer retention, City Wide of Tampa Bay services more than 150 customers in the Tampa Bay area! Working everywhere from schools to hospitals and everywhere where businesses want to stay clean, they help keep their client’s workplace clean and free of sickness causing agents, therefore maximizing attendance rates of students and employees! If you want to learn more about Jamie Welcomed John Duffy and Steve Howerton and City Wide Management Tampa Bay, head to http://www.gocitywide.com!